Refrigerate the peach nectar and apple cider so they’re very cold when you’re ready to serve. Pour 1/3 of the peach nectar into a nice glass then add the cider little by little until half of the glass is full. Decorate with fresh peaches and serve immediately. This drink is very tasty and delicious, perfect to drink before dinner or served with French pastries in the afternoon. You can use champagne instead of cider if you prefer an alcoholic beverage. Mothers Day is always a special day when we celebrate with our mothers as well as our children and husbands. This is why I want to share this recipe with the kids and husbands who are looking for menu ideas. Surprise the special woman in your lives with this delicious Italian Bellini. This drink is very refreshing and it combines peach juice with apple cider. 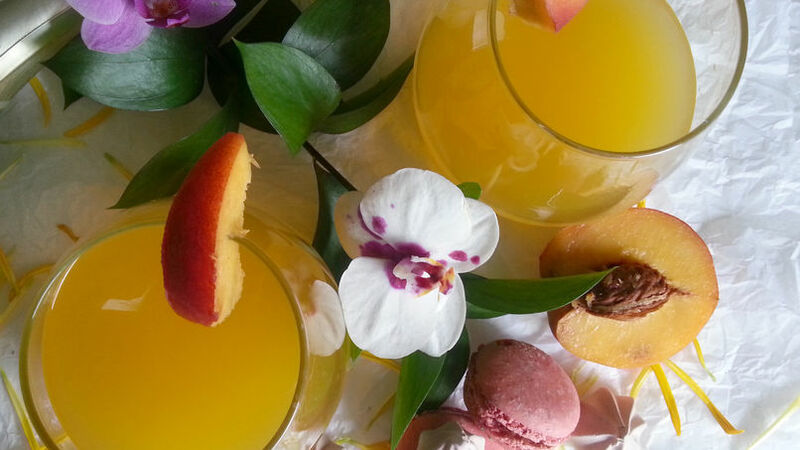 This mocktail is very elegant, even more so if you serve it with merengues or macarons from her favorite bakery. Enjoy!